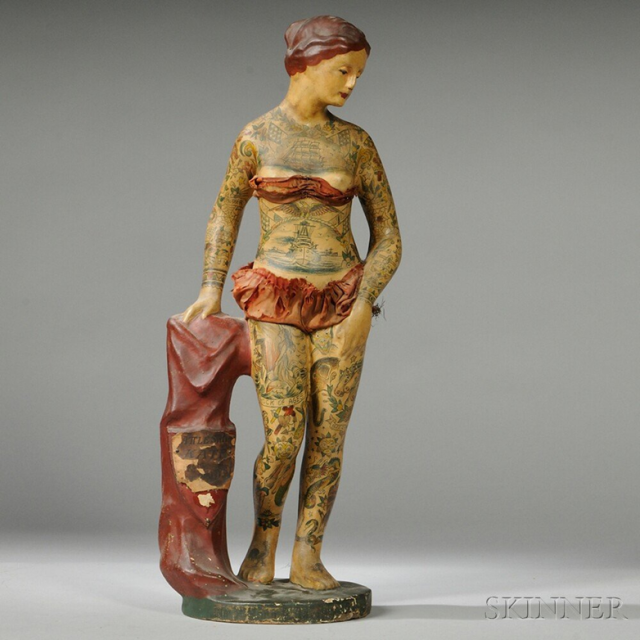 Record setting price was set at auction for tattooed figure. Hammer price for this two and 1/2 foot tall composition figure was $23,000. Add the 25% buy in commission, tax and other official sounding crap and you're up around $30,000! One famous Folk art dealer went as high as $2,500. "Well I guess I did not get it." he said, adding that "... very little sculpture exists in that area from the 19th century." Battleship Kate probably stood well protected, set back on a countertop. Not a sunburned window display as the condition is pretty good.We still don't know if she is chalk or paper mache statue, the catalog description of the item was awful. The bids came quick and furious. 24k was retracted at the last second as 23k drove it home. This record sale makes it clear it's smart to get the best pieces available. We were stunned at prices the Wm Grant & Sons distillery layed out on their Sailor Jerry buying spree a few years ago. Stunned to see a $18,000.00 price tag on a Darpel at the Outsider Art Fair. Great piece, but 18k? Kind of leaves a few of us out. Like the entire tattoo collecting community. Tatooists, collectors and historians are not concerned. Most of us buy when we can and sell when we have to. But in the end what does this tell us? Perhaps the deep pocket collectors, the Wm. Edmondson and Bill Traylor folk art crowd have finally arrived at the tattoo parlor. Making room on the folk art high pedestal for tattoo flash. It will be interesting to watch the next auctions. Also to see what pieces come out when word circulates about the high dollar numbers. We will probably start to see more doctored items. Caveat Emptor. Where there is money, bogus items will follow.